Combining comfort, ease of use and a choice of fun prints the Action Baby Carrier is a great choice for carrying your child from approximately 18 months. They can be worn on the front, hip and back, fully illustrated instructions included. The Action Baby Carrier has a unique internal support system that offers unparalleled support for your baby without the need to fit additional harnesses or buckles. Durable canvas construction combined with a flexible padded waistband and soft shoulder strap padding makes the Action Baby Carrier a truly comfortable way to carry your baby or child. Quickly adjustable enabling use by wearers of different body shapes and sizes with ease. 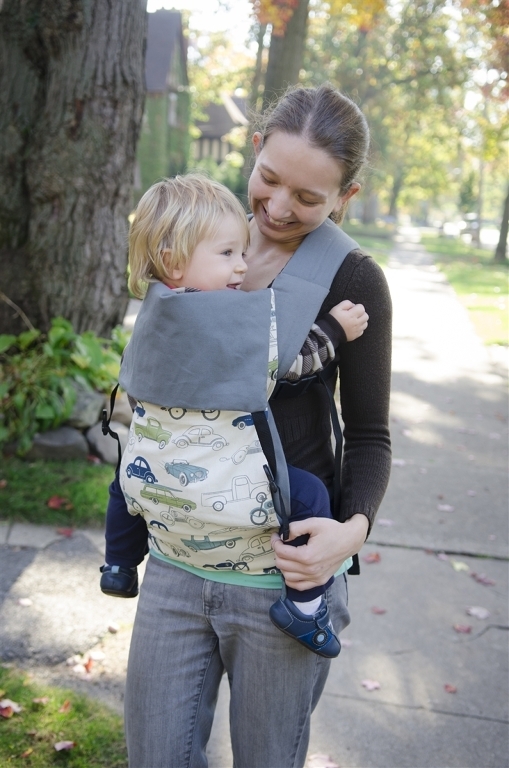 Action Baby Carriers come with a simple to use sleep hood, and fold down small to save space. Suitable from 18 months to 5yrs - 6.8kg to 20.4kg, perfect for larger toddlers who still enjoy being carried. Image shows baby size. Manufactured ethically in Michigan, U.S.A. Each carrier is individually constructed on specialist machines. Action Baby Carriers are tested and compliance approved to BS EN 13209-2:2005. SEE FAQs for detailed specifications and care instructions.